The hotel in which I stayed during my weekend in KL was one block from one of the two most favored night markets in all of Kuala Lumpur. I did not know this until the German girl showed me the section on night markets in the travel guide she was referring to in planning what she wanted to see. 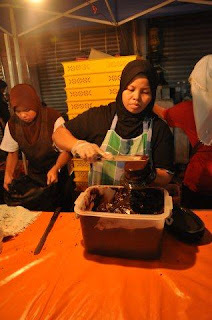 Bob had also nearly lost his mind when he saw how close my hotel was to the Lorong Tuanku Abdul Rahman pasar malam. “Oh, it is only one block from you! You must go! The whole street is taken up with vendors and lights. It is really something!” The torrential rains from the afternoon had stopped by evening and so walking through a street filled with tented stalls and stringed lighting was too incredible to pass up, even though I was so tired I could have slept standing up. I grabbed my camera and some money and went in search of food, treasure and mostly just to experience what Pasar Malam means in KL. Bob was right about the vendors and the lights, but he had not mentioned the crowds…though I imagine that was to be expected. 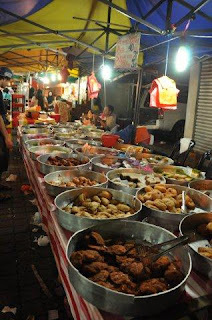 The atmosphere is like a party, the vendors know each other and are shouting to each other back and forth and laughing so that the whole thing seems like a massive party, where you just happen to buy things. The stalls are about half food related with the rest selling clothing, toys, bags, electronics and other various things. I did not notice anything handmade there, besides the food, and did not end up purchasing anything. Well, I did purchase food. A lot of it. But the quantity was more about self defense than about my hunger level. This was a fairly typical layout…impossible to tell what anything is, but beautiful. Once again, I could identify nothing. I even ventured to ask on multiple occasions…not complex questions about what something was…just basic questions “Meat? Vegetables?” A phrase book would have been helpful. Several times, as I asked the questions, a few young Malaysians nearby leaned in, roguish smiles on their faces, to hear how it went for me, as if perhaps they would have a story to tell their friends later about the crazy woman in the bazaar who did not even know what a “Popia” was or “Tamil Nadu.” In the end, I just bought things that looked interesting and looked like there was no meat involved. My hands hurt carrying them back to the hotel. It was just a normal cake…so I did not end up eating it. One thing was spiral cut potatoes, fried and seasoned. I like that, of course. 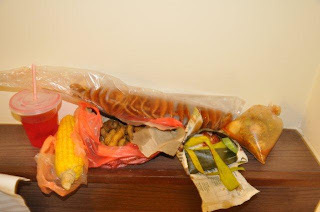 There were various preparations of rice in banana leaf packets, some sweet, some savory. I did manage to avoid meat altogether, which was good. But the Indian food here was MUCH sweeter than I had tasted it anywhere else. It was filled with sugar cane juice (which I saw them squeezing and numerous stands), sugar and coconut milk. Even the dinner dishes. In fairness, I did not try any of the meat, so I can’t speak to how that is prepared…and my veggie selection was limited. But I could not take more than one or two bites of anything I got because of the sweetness. Well, except the potatoes. But that was no matter. What an incredible adventure to be trying all kinds of dishes I could not recognize in a hotel room in KL. No plates…no fork…no napkins, Just bags, one spoon and a couple of sharp sticks to poke at my food…oh, and some tissue. I am figuring I am going to need to pack a little camping kit in my suitcase next time I am traveling like this. If for no other reason, for the pictures. The food was good for the most part, and probably delicious warml. I am off to sleep feeling cozy and well fed. 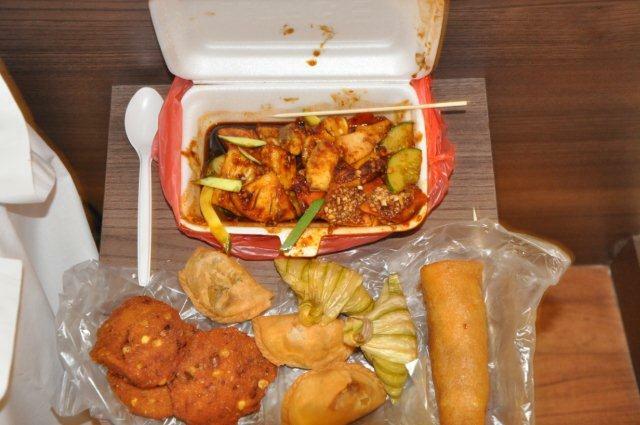 Because even two bites of a selection of food that varied, is plenty for a dinner.